Let me start off by saying that I have been on a blog writing slump for well over a year for shows I've seen in person let alone it be one of few shows I've seen in quite some time. Work has kept me busy last year while I was working abroad in London UK for six months. Who gets me off this blog writing slump? 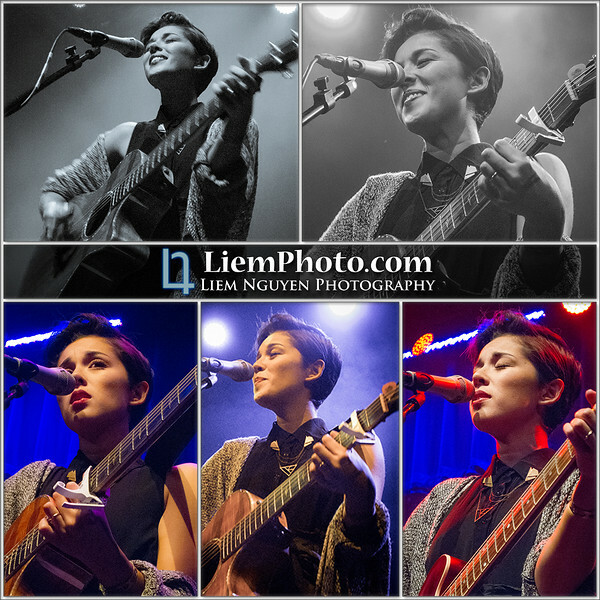 One name, one artist, one YouTuber, one lady by the name of Kina Grannis! It has been nearly over two years since Kina has toured to the Washington DC/Metro area. She returns as the new Mrs Kina Grannis married to Jesse Epstein also known as Imaginary Future. This time to promote her latest and newest album called "Elements" which was released earlier this month in May as well as sporting a much shorter haircut giving her a more mature appearance. With all the changes that has happened over the years, she's still the same Kina we all know and love--her music, her personality, her humbleness, her down to Earth self continues to bring in more new fans, or Kinerds, and continue to stay in touch and remember old ones who has supported her since her days of the Doritos Crash the Super Bowl stunt. During this return, she chooses a venue and location in the area that she has not ventured into before. She comes to The Birchmere in Alexandria, Virginia. A very well-known and popular music/dining venue that was was one of the top in the world a few years ago for bringing in sales world wide. What makes this venue nice is that it gives you a very vintage feeling once you walk inside and at the same time gives you the chance to enjoy a few drinks with friends before the show, then enjoy yourself to some fine dining while watching the show. It was my first time at the venue, and I was very impressed with it and how they handled a sold out show. Great lighting and great sound. My only disappointment is that the venue did not allow video recording even after approval from Kina's manager, but this quickly was not a problem because Kina again has exceeded everyone's expectations for the show. She puts on such a great show, and the usual intimate style show she throws at these small to medium sized venues. Before I continue, let me explain to everyone how much I respect Kina, her music, and her just as a regular human being. The way she connects with her fans and supporters is one reason why she is one of my top favorite musicans of all time. It doesn't matter if it's Britney, Madonna, Cher, or Michael Jackson; Kina would trump them all. 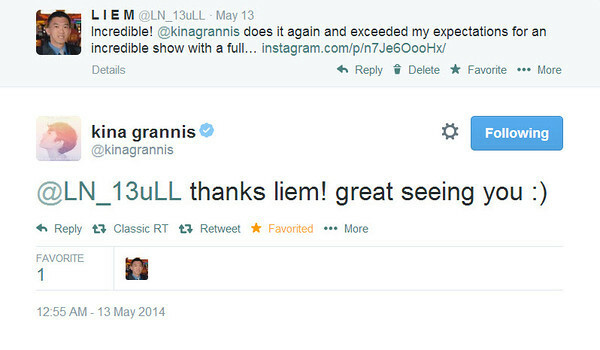 I found out that Kina was coming to DC for her Elements tour way back in March and was excited to see her again for the 4th time (but 5th show). Before I bought tickets, I promised a couple of my friends that I would mention it to them to see if they wanted to go because in the past, something always came up and they couldn't go. This time, they were able to go and excited to go as they have waited over 3-4 years to see her perform live. On the day of the show, I have already made arrangements a few weeks earlier to take the day off from work for the show. One thing I've learned about Kina shows, is that Kinerds make a grand entrance by coming in line early to get good seats for the show. This time I decided to try to outdo them all so that my friends can have their first small venue music show a memorable one. I arrived at The Birchmere three hours before the show started. I was surprised to find out that I was the first in line which was great. about half an hour later, fans started to arrive before doors to the venue opened. Coming in, I rushed to the box office to pick up my tickets and asked them if I could leave my friends' tickets there for them to pick up. One thing I loved about the venue which I wish more venues would do is a ticketing system for the order of entry so no one fights over getting into the stage once doors open for that. After entering the venue with my ticket in one hand, my ticket number showing '01' in another hand, and my camera bag on my back, I went to sit at the bar and wait until the stage door are opened for my number to be called. Half an hour through waiting, a few other friends I made from other shows or previous Kina shows showed up. This was great because they were all able to enter the stage with me to help me save three out of seven seats for my friends at the table. Being that I was the first to enter the stage, I was able to pick the best seats (table) for taking pictures and for my party to sit. I picked dead center right in the front. Before the show started everyone including myself decided to grab some food from The Birchmere's menu. I got chicken strips and fries; just something simple and quick to eat. The show starts promptly at 7:30 pm and Jesse Epstein also known as Imaginary Future comes out on stage first to open the show. He spends the first hour of the show to perform songs off his new album as well as a few from his old album. On top of his originals he also gave his cover rendition of Lorde's song "Team". It was nice to see him back on stage opening for Kina for the third US East Coast tour. After Jesse is finished with his set, we go into intermission while the staff prepares all the equipment for Kina's set and everyone else stretch their legs. The staff also quickly cleaned up all the tables and get the bills out to close out all tabs before it gets crazy after Kina finishes her set. Soon after intermission finished and people took there seats again, the lights dim again and the band comes out to start playing "My Dear" as Kina's first song from her set. 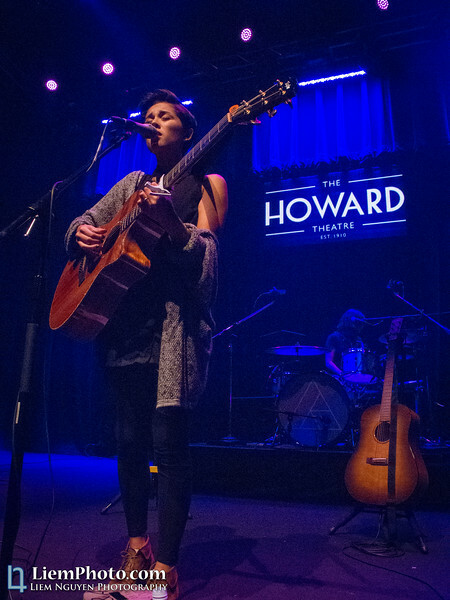 This was the first time that Kina has brought a full band to her tours on the east coast of the U.S. Her band for this tour consisted of Jon Titterington on the keyboard, Darla Hawn on the drums, and her husband Jesse on guitar. As the band starts playing, Kina soon after comes out with her guitar at hand to a roar of cheers to welcome her on stage. Her set for the tour consisted of most of her songs from her new album Elements and a few popular songs s uch as "Valentine" and "In Your Arms" from her previous Stairwells album. After seeing her at shows for the 5th time, this is by far the best because she brought something different to the table for the east coast. The full band made the show so much more filling on top of her beautiful voice singing her songs. It was overpowering; but not overwhelming with the band there. It was a great mix where the band did not overcome her vocals. Show after show, she continues to exceed my expectations watching her perform live. Seeing her live never gets old and never gets boring. Her interactions with her fans are just mutual and also genuine. She ended the show with a hinted encore performance consisting of not one but two songs. The usual unplugged version of "Message From Your Heart" and a fitting "The One You Say Goodnight To" to say good night and thank you to all her fans for coming out to see her, Jesse, and the band perform in Alexandria, Virginia. There were several things that stood out the most to make this show memorable just like her previous shows in Washington DC/Metro area. The first was that she called me out during her show before she performed "This Far" asking me to confirm that she did sing that last time she was here in DC. She basically surprisingly looked down to me and told the crowd she was looking down at my to ask that question because she knew me and that I went to all her shows in the past. It was a nice gesture from her to acknowledge me during the show. The second was that the VA show was the first show during this Elements tour where she took a panoramic picture of the crowd and posted it on her social media pages. Before taking the picture, I yelled out to her to make sure she tells everyone to not move during the picture so that it can be as clear as possible. She heard me, so she gets back on the mic to tell everyone to make sure they don't move but act like they have a lot of energy with their hands in the air and yell. First attempt with the picture was done by Jesse which was a complete failure because he swept the camera from left to right in like two seconds. Second attempt was done by the keyboardist, Jon, which was a success. Lastly, it was also Jon's birthday, so the staff at The Birchmere got him a cake and he was munching on his birthday cake throughout Kina's set. After the show ended, everyone rushed out to start standing in line for the meet and greet to see and talk to Kina including myself and my friends. The line was probably the longest meet and greet line I've been in which wrapped around all four sides of the building. We were in line for over an hour and a half but time flew by quickly thanks to all my friends who kept me and each other company while in line. Once it was close to our turn to see Kina, I offered to take everyone's picture since I had a nice camera. Group by group, I took pictures for my friends. Once they were all done, it was my turn to see Kina. As usual she greets me with open arms for a warm Kina hug. There's not many artists where I feel comfortable giving hugs to. The only other person I probably feel comfortable hugging is Marie Digby. These two are the two which I feel like we are close but distant friends that don't get to see each other often enough. I asked her to sign her Elements album, In Your Arms promo single, Stairwells Japanese version album, and also a picture of her and me back when I saw her in 2012 at Baltimore Soundstage. She graciously signs them all with such a happy smile on her face that, in turns, would make anyone smile right back at her. She is, as usual, down to Earth. That's one thing I love about Kina is that whatever fame she has received over the years, she continues to be herself and humble about herself and to her fans and supporters. She has called me by name more than several times when I was talking to her at the meet and greet. It may not mean much to some people, but for someone who meets thousands and thousands of people online and at shows, I do not know how she can remember so much in that head of hers. I gave her one last hug before I leave and wish her the best on the rest of her tour. After getting all the stuff I had signed by Kina put away safely in my bag, I went over to say hi to Jesse. He is also very humble and very easy going type of person to talk to. I had a quick chat with him and he says that they will be coming back again in the Fall of this year and hope I can come out again to see them. I obviously told him I will come again, and again to see them both, and I wouldn't miss the show for anything. I had a picture taken with him and that ended my night at The Birchmere with Kina and Imaginary Future. In conclusion, this night could not be any more better and could not go any more smooth than I could have made it. Everything went as planned in my head except for not being able to record the show on video like I usually do. It was another show and tour that Kina put together that is unbelievable. She is one of the few artists that I can say as well as on behalf of all my friends that came to watch the show that she sounds so much more vibrant and so much more lively and sounded more beautiful than on video or even on her mastered album. For my friends that has never seen Kina performed before as well as never been to a venue this small to watch a musician play, they say it was incredibly good and that they are all in for it again when Kina returns. I was so happy and pleased that they enjoyed the show as much as they did and that I was able to get the best seats in the venue for them to enjoy the show. Again, to Kina and Imaginary Future, thank you so much for making beautiful music and for coming back to the DC/Metro area for another show of a lifetime. For anyone that has never seen Kina perform in person and have heard her music or just know of Kina, I completely and highly recommend you to see her perform live. Even the live recordings you may find on YouTube will not give you the experience you will get by seeing her perform at these small to medium venues. You will NOT be disappointed as I have not seen anyone walk out feeling they wasted their money. Although, I was not able to record video from The Birchmere, I do recommend you watching Kina's Elements Album release show in LA at the Troubadour in its entirely. Video credit goes to YouTube user, wumangorocks. And as for the pictures that I was able to capture from the show in Alexandria, see below. It is one of the best pictures I have taken of Kina since I started going to her shows. I hope you enjoy them as much as I took them and retouched them. If you’re interested to know more about both Kina and Imaginary Future and would like hear more music by them, please do check out their website and social network pages below. As always, go out and support Kina Grannis and Imaginary Future by going to their shows and buying their music.